We analyzed the concentrations of 6-sulfatoxymelatonin (6-SMT) in working-age men (aged 19–69 years) living in the European part of the Arctic zone of Russia. The 6-SMT level in the studied group was similar to that in the control group of men living in Western Siberia. The 6-SMT level decreased with age and reached the minimal values at the age of 40–49 years. 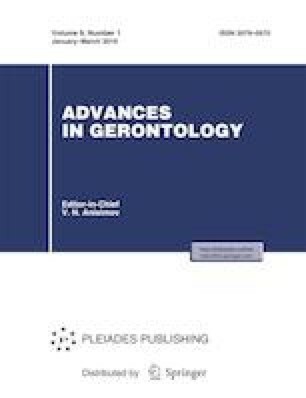 In the group aged 60–69 years, there was a tendency to increase; however, the difference was not statistically significant (p > 0.05) as compared with men aged <29 years. We observed the effect of alcohol use on the 6-SMT level; it was lower in men who consumed alcohol than in nonconsumers. The plasma level of free testosterone decreased with age; this value in the group aged 60–69 years was 50% lower than in the group aged 29 years. We observed the activation of lipid peroxidation, which was not compensated for by a higher activity rate of glutathione-reductase or higher plasma levels of SH groups as compared with the control group. Age-related decrease in the level of melatonin, which is an endogenous antioxidant, was associated with a gradual accumulation of peroxidation products and reduced activity of the antioxidant system due to decreasing level of SH-groups. We used the equipment of the common use center Modern Optical Systems of the Federal Research Center of Fundamental and Translational Medicine (Novosibirsk, Russia). We thank N.K. Belisheva (Research Center of Medical and Biological Problems of Adaptation in Humans, Russian Academy of Sciences, Apatity, Russia) for her help in the organization and with the conduct of this study. The study was supported by the Presidium of the Russian Academy of Sciences within the Program of fundamental studies “Exploratory Fundamental Studies for the Development of the Arctic Region of Russia”. Statement of compliance with standards of research involving humans as subjects. All procedures performed in studies involving human participants were in accordance with the ethical standards of the institutional and/or national research committee and with the 1964 Helsinki Declaration and its later amendments or comparable ethical standards. The study was approved by the Ethics Committee of the Federal Research Center of Fundamental and Translational Medicine. The subjects signed informed consent after the nature of the study had been explained to them.